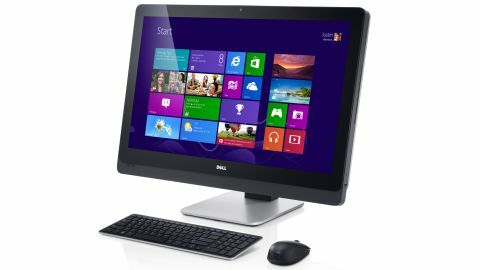 The release of Windows 8 has led to a resurgence in all-in-one PCs such as the Dell XPS One 27 Touch. While Windows 7 was an excellent desktop operating system, it sat awkwardly on touchscreens, which prevented all-in-ones such as the MSI Wind Top AE2210 and the Sony Vaio L Series from reaching their full potential. Things were even worse when manufacturers slapped their own clunky touchscreen interfaces over Windows 7. With Windows 8, Microsoft has built an operating system with touch interfaces at the forefront, which means that navigating the operating system by touch alone is now a much more pleasurable experience in both the new Windows 8 Start Screen and apps, and in the more traditional desktop mode. Mobile components have also become smaller and yet more powerful at the same time. This matters because the insides of a slim all-in-one computer can resemble the innards of a laptop rather than a desktop PC. The improvements in the technology that resides within an all-in-one PCs means they can be slimmer and more attractive - essential for a PC that wants to be part of your living room, rather than hidden away in an office - while running the latest programs and apps with ease. The combination of a brand new operating system and technology to back it up has created a perfect storm, from which a truly desirable all-in-one PC can emerge. Will the Dell XPS One 27 Touch be that PC, though? Also, while operating system (OS) and technology innovations have conspired to create a more accommodating environment for all-in-one PCs, the economic climate remains an elephant in the room. All-in-one PCs are usually a lot more expensive than standard desktop PCs, and the Dell XPS One 27 Touch is no exception, coming in with a full price of £1,779/AU$2,499/US$2,000 for the version we tested. That's a lot of cash to put down, so the Dell XPS One 27 Touch better be worth it. As is often the case with Dell PCs, there are a number of configurations for the Dell XPS One 27 Touch. The basic model comes with a third generation Intel Core i5 processor, 6GB of RAM (8GB in Australia) and a 1TB hard drive, all for £1,499/AU$1,999/US$1,599 from Dell. The mid-range version beefs up the processing power with a Core i7 processor, 8GB of RAM and 2TB of hard disk - it's also the version that we tested, and it'll cost you £1,779/AU$2,499/US$1,999.99. Finally, a high specified version is available on the Dell US online store that comes with 16GB of RAM, the same Intel Core i7 processor, 2TB of internal storage plus a 32GB SSD, and a Blu-ray drive, and will set you back US$2,499.99. Having a third generation Intel Core i5 or i7 processor in the machine is quite a boon, because along with speed advances, the new processors include improved onboard graphics in the shape of Intel HD Graphics 4000. While it won't be able to run a lot of graphic-intensive games, for the casual games found on the Windows Store it's more than enough. It also handles high-definition content without a problem, which is important, because the Dell XPS One 27 Touch comes with an absolutely stunning 27-inch screen with Wide Quad High Definition (WQHD). That's 2560 x 1440 pixels, twice the resolution of 1080p Full HD, and on the large 27-inch display it looks wonderful. The high resolution looks great in Windows 8's new interface, and there's plenty of screen space in both the full screen apps and on the desktop. It means that on the desktop, windows and text are a lot smaller, which leaves more space for additional windows and programs to run. On a large 27-inch screen this shouldn't be a problem to see, but if you're using the touchscreen then the smaller toolbars might be a bit more fiddly. You can alter the resolution if you're having problems, but on the whole this is one beautiful screen that's responsive to touch. The overall design and feel of this all-in-one PC is solid and attractive. We'd have no qualms about housing this beauty in our front rooms or bedroom. As a replacement TV it has a built-in TV tuner card, which means you can watch TV without having to turn on the whole PC. It can't be accessed through Windows 8, though, so you won't be able to use that roomy hard drive as a PVR unless you buy a USB TV Tuner. An HDMI-in port enables you to hook up a Blu-ray player or games console to the Dell XPS One 27 Touch to use it as a HD TV, while an HDMI-out port enables you to add a second monitor or TV to the all-in-one if you want even more desktop space. An optical audio port enables you to hook up the Dell XPS One 27 Touch to a surround sound setup or external amplifier to turn the all-in-one PC into a fantastic media device. An included wireless mouse and keyboard rounds off the package, and though they seem a bit no-frills, they do the job.